There are two types of interpolation that can be done from the Interpolation tab in the Velocity Picking window. As you pick, Insight will interpolate the picks to create a complete velocity model. Select the Extrapolate check box to create a velocity model that is complete within the entire area of the input gathers (for a 3D volume, a rectangle surrounding the gathers). Leave the box unchecked if you wish to only interpolate areas between picks. 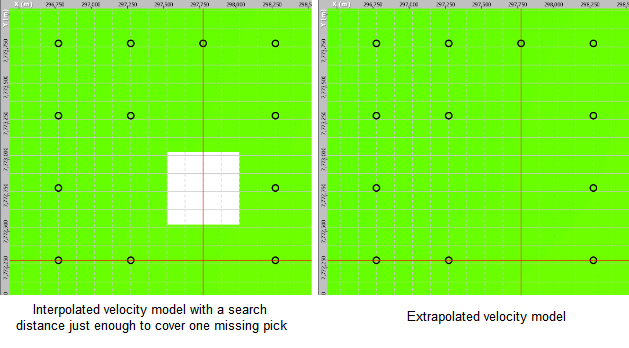 If you do not Extrapolate, define the Search distance (m) in which data must be found to interpolate the volume. A point that is beyond this distance from its nearest neighbour will not be interpolated. At Spreading power, type the value for the Voronoi area weight used in the operation (see Horizon Interpolate/Extrapolate). Type the Smoothing power used in the operation. This defines the inverse distance power (see Horizon Interpolate/Extrapolate). The example below illustrates the difference between an interpolated and extrapolated velocity model. When you pick at a new location, if the interpolated velocity model covers that location, additional picks are automatically made to match the interpolated velocity. These two parameters control this interpolation of new picks. Maximum Picks — Select the maximum number of picks Insight can automatically add. To disable any automatic picks, type 0. Minimum Spacing (ms) — Select how far apart each automatically-added pick should be from one another.